TROIS RIVIERES, Que. - Quebec provincial police have found the remains of a girl who went missing in 2007 when she was nine years old. Police confirmed late Saturday that human bones discovered Friday evening in Saint-Maurice, near Trois-Rivieres, are those of Cedrika Provencher. 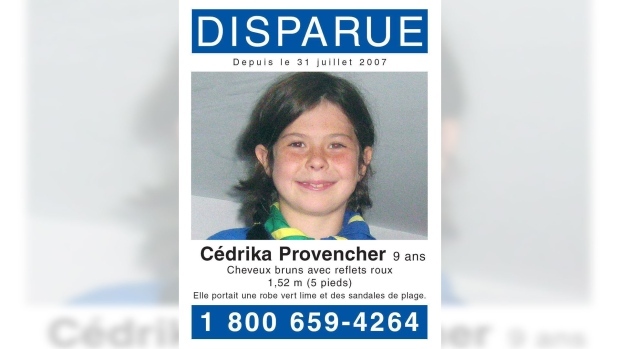 Provencher was last seen on July 31, 2007 near her home in Trois-Rivieres, about halfway between Montreal and Quebec City. She vanished after reportedly helping a man look for a lost dog. At one point in the investigation a $100,000 reward was offered for information leading to an arrest. No arrests have been made, but police say the investigation is ongoing.